Cub Scouts are young people usually aged between eight years and ten and a half years old. They belong to the second Section in the Scouting family. There are loads of fun things that you can do as a Cub Scout. You will get a chance to try lots of different activities like swimming, music, exploring, computing and climbing. 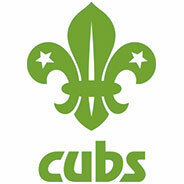 Badges can be gained by taking part in activities at Cubs and elsewhere. Typically we will offer several residential experiences (either camps or indoors) over the course of each year, with trips ranging from 1 to 2 nights. Melksham Cubs also enjoy District events and these in the past have included camps, cooking competitions and activity days. Slindon Cub Pack, which meets at The Scout Hall on a Tuesday evening, although many of our meetings are held outdoors at other locations, especially during the Summer. There is normally a waiting list to join the packs, so if you are interested please get in touch as early as possible! For more information, or to join Cubs, please visit the “contact” page.